Tikuanyin” is a famous species of tea trees, with the leaves being common raw material for Oolong. As a place of origin of Tikuanyin, Anxi region in China is also the main production region of Tikuanyin. The leaves are low-yield owning to delicate nature of this species, yet are of extremely excellent quality. Anxi Tikuanyin is a kind of semifermented tea, the fabrication of which is featured by both fermentation of black tea and non-fermentation of green tea. The processing technique is highly exquisite, comprising over ten working procedures. 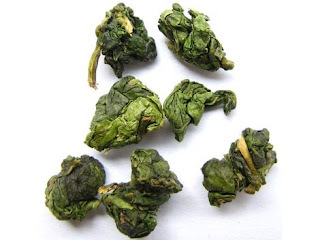 The finished tea is featured by sturdiness and heaviness, with red spots scattering on the green leaves and hoarfrosts attaching to the surface. It is, after being brewed in hot water, characterized by intense fragrance, golden liquor, sweet aftertaste, and faint scent of orchid, peanut kernel or coconut. Tikuanyin is brewing-tolerant and can retain faint aroma after being brewed for seven times. Being a natural and tasty drink, Tikuanyin is endowed with comparatively high healthcare value. Other than having healthcare functions similar to those of general species of tea, it provides efficacies of antiaging, anticancer, anti-arteriosclerosis, diabetes prevention and cure, weight loss, body building, decayed tooth prevention and cure, clearing heat, purging evil fire, reliefing smoking-induced detriment and removing or dispelling the effects of alcohol, etc.